For all you theatre-lovers out there who don't have the good fortune of living in London, the National Theatre Live is a wonderful program to keep tabs on, as they frequently take the best and biggest productions running in London and film one of the shows to be broadcasted in cinemas worldwide. 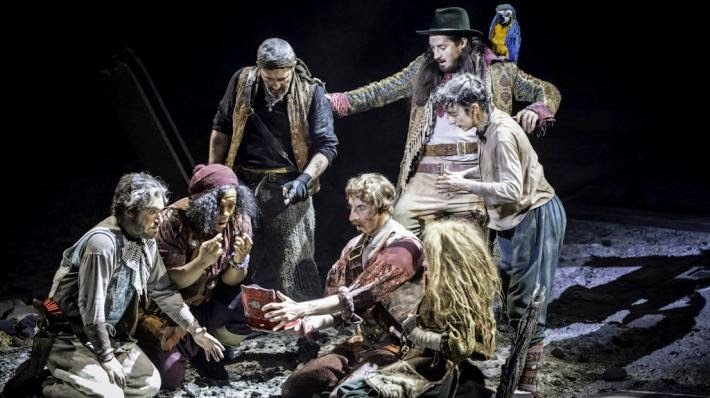 We didn't even realise that Robert Louis Stevenson's "Treasure Island" had been adapted for the stage recently until we met Arthur Darvill at Walker Stalker San Francisco and upon being asked what he was up to, he told us he was in a play in London. Immediately, our curiosity was piqued. Bryony Lavery's adaptation was throughly bigger and better than we ever could have expected. The scope and intricacy of the sets is truly incredible, which establishes a strong foundation for the show. The gender-bending cast of of Jim Hawkins was highly welcome. One of the great things about theatre is that it is often at the forefront of pushing boundaries in media. Patsy Ferran was endearing and moving as young Jim, striking a chord in the audience of the growing pains of losing one's naiveté. With her leading the way as both protagonist and narrator, we gained a whole new insight into the story of "Treasure Island." Joshua James was another newcomer that impressed us, as his meticulously developed physicality, mannerisms, and speech pattern all had us laughing and routing for this neurotic, slightly unhinged genius Ben Gunn to make it out on top in the end. We saved the best for last: Arthur Darvill. Though many know him from the hit shows "Doctor Who" and "Broadchurch," this is by far the most impacting work we've seen from him yet. With a devilish charisma, Darvill brings to life a highly multi-faceted character that challenges us. It was immensely gripping to watch because we genuinely never knew what Long John Silver would do next. The wardrobe was also fantastic. Despite the fact that Silver in his most boisterous moments had the most flamboyant outfits of the entire show, Darvill's commitment and fearless approach to the role sold us on what otherwise might have ended up being entirely ridiculous. If you want excitement, dimension, and an all-around superb viewing experience, catch NTL's "Treasure Island" in your local cinemas.